For several years now, we have been raising our own meat. It may sound hard and complicated but it really isn’t that hard. My men and boys around here may have just laughed at me for saying that since basically my contribution in the meat raising department is just about nothing. I mean, I do put kitchen scraps in the pig bucket and give plenty of verbal reminders to “Go Feed The Pig”. I guess that counts for something! 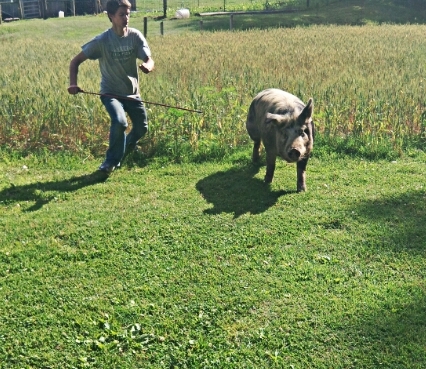 Here is one of the times the pig escaped and went running through the wheat plot after eating some marigolds in the herb garden. Our older boys ran him back to his pen before more damage was done! No harm was done to man or beast when this picture was taken even if there was a bit of giggly, screaming from the little human on watchers and plenty of snorting and grunting and running around in circles from the beast. Our very own circus! This week, my guys loaded our large, happy hog and 5 sheep onto the trailer and headed to the butcher. We had minimal mishaps raising this batch of animals. Our middle boys fed and watered the pig every day. Our older boys chased him back to his pen a few times when he got out and wandered into the yard to dig up my herb garden. My husband devised a faultless plan to load the hog in the trailer with minimal loss of salvation. He learned after the first year, pigs do not just hop in the trailer when it is time to go to the butcher. However, if you back the trailer up to their pen and dump a yummy bucket full of homemade scraps fermented in raw milk in the trailer……a hungry pig will fall for the bait every time. Off to the butcher they went. 2 weeks later, we go to retrieve our pastured pork and lamb. Now, I need another pig to keep up with the kitchen scraps!